NYPD Red 3 opening line: Every December 31, Hunter Hutchinson Alden Jr. made the same two New Year’s resolutions. Hunter Alden Jr.has it all: a beautiful wife, a brilliant son and billions in the bank. But when his son goes missing and he discovers the severed head of his chauffeur, it’s clear he’s in danger of losing it all. The kidnapper knows a horrific secret that could change the world as we know it. A secret worth killing for. A secret worth dying for. Written in conjunction with Marshall Karp, this book took me 3 days to read. I did not want to put the book down as I got to know detectives Zach Jordan and Kylie MacDonald. This is the 3rd book in the series, and I was pleased to be able to read it without having to know what came beforehand. The story revolves around a wealthy family, and why Hunter makes his two resolutions. The one is to be worth X dollars by the end of the year, and this need to be worth so much is what costs Hunter more than he ever bargained for. This book was so good, even Dave did not want to put it down when he started reading it! It involves murder, kidnap and ransom. A perfect combination of crimes and motives for anyone with so much money. Hi Tandy, my husband and I have read many of his books will have to check this one out. I love James Patterson’s books. I haven’t hear of this series, so I’ll have to check this out. Thanks for the heads up! sorry for the over posting,.. please delete the one you choose.. but apparently there’s a limit on words per comment, or, I hit the wrong thing twice..
what I was trying to say in conclusion is; “Love you and your foody blog stuff more than any Detective Novelist.. I have read a few James Patterson books, and to be honest I respect him a lot, as a seasoned, published writer, -but, for some reason books written in “first person” narratives don’t flow through me like 3rd person writings do. It’s probably just me, and this one may be different… and .. of course, now that you have presented it .. I’ll have to read it for myself to find out… I do love adventure novels though, and he’s got the attention of a lot of people… or, his ideas, and ghost writers do. I found this novel to be worth the read, not all of his books are! 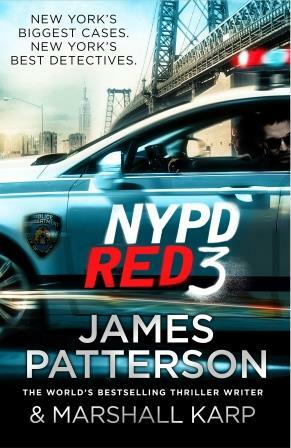 Definitely going to be looking out for this – I have always enjoyed James Patterson – thanks Tandy.